We all know Metrix is a great place to work on school or personal projects and create just for fun. However, I recently learned of someone using the space in a more professional manner. 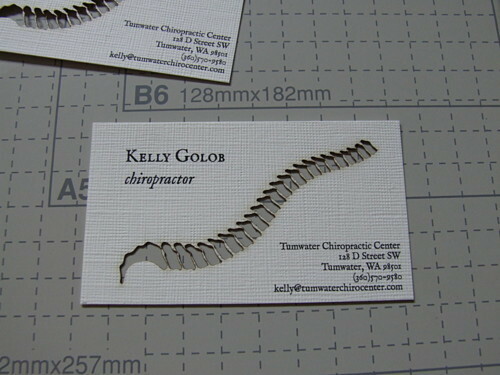 Kelly Golob recently graduated from Southern California University of Health Sciences and is now practicing chiropractic care at Tumwater Chiropractic Center. What’s the first thing all those business blogs, books, and your friends tell you to do when you start out working? 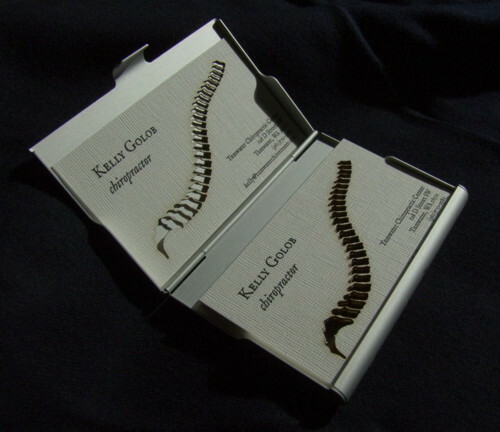 Get business cards of course! Kelly decided (with the help of a designer) to get his cut at Metrix! I myself just recently purchased my first box of cards after needing them on many occasions these past couple of months. (Seriously, don’t skip this business step!) Mine are fairly traditional, but his really stand out! I love how cutting out the spine from the paper adds a lot of uniqueness and interest to the card, without leaving it cluttered. The holes are a great use of negative space and are simple and complicated at the same time. I think my future cards might be cut from the laser, just seeing the really cool results Kelly had. You can see his site at www.kellygolob.com/ and his designer’s site http://www.applied-sciences.net/. Hopefully I’ll see you working for your business ideas too!